Travel and tourism can have a huge negative impact on the environment, especially in ecologically sensitive areas. With the worldwide rise of Airbnb, responsible travelers' accommodation choices have expanded exponentially. Now, you don't have to stay in a chain hotel where the only nod to eco-sensitivity is reusing your towels. These seven Airbnb properties are not only exotic, they are also immersed in nature and totally off-grid. Hidden in the Balinese mountains, far from the tourist hordes who blight Bali’s beaches, the Hideout makes visitors a part of Balinese village life. Vibrant green rice fields and a shimmering river are on display just outside the bamboo walls and exotic sounds of the Balinese jungle drift through the property. Electricity and water are both provided by the onsite waterwheel. How cool is that? For tourists wanting to shed their hectic lives on a secluded island, these three eco tents in a remote corner of the Isle of Skye are just the ticket. Visitors spend their days hiking the rolling Scottish landscape or wandering along the deserted beach. Each tent is fully furnished and has its own fire pit and outdoor BBQ, while a shared camp kitchen tent is kitted out for cooking. Composting toilets and a “unique shower” round out the off-grid back-to-nature experience. 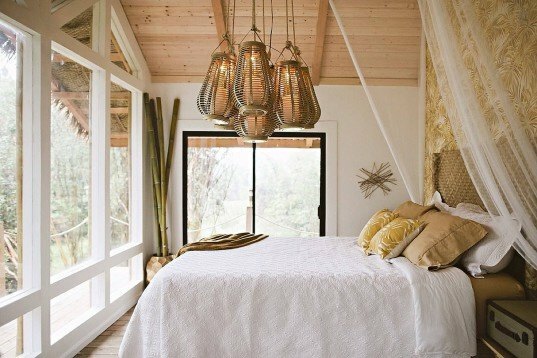 A treehouse hanging 15 feet above the ground, nestled in the canopy of the Fern Forest of Hawaii, this property puts guests at the heart of the tropical jungle. Guests are serenaded by the sweet chirping of coqui frogs as they fall asleep and can often hear the grunts and squeals of the wild pigs that roam the land. Raindrops hitting the roof are collected for shower water and electricity is provided by the sun, so blow-dryers and other electricity-sapping electronics should stay home. With no running water or electricity, the island of Koh Ta Kiev is not exactly a tourist hot spot, which makes the Ten 103 Treehouse an idyllic location for letting go of all the stresses of everyday life. Each stilt house is hidden in its own part of the jungle, meaning once visitors step inside, the rest of the world just slips away. 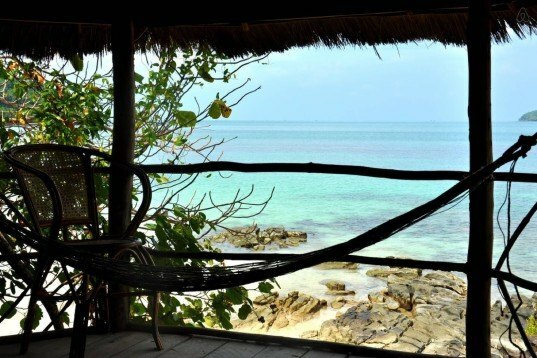 The open bamboo huts sit right on shore, providing wide open views of the warm turquoise water just a few steps away. Without electricity, the staff create gourmet meals in the resort’s wood-fired oven and Texas-style smoker while bucket showers and pit toilets negate the need for running water. Settled on the edge of an enchanting Irish forest, this A-frame wood cabin may be the perfect place to meet Faerie folk. At the very least, guests will get to enjoy other wild creatures of the forest, like deer, foxes, and hedgehogs. The cabin is equipped with a gas heater, solar powered light while fresh well water fills guest’s glasses. A communal kitchen and fireplace allow visitors to gather in the evening and share their enchanted forest stories. One of the more luxurious properties on our list, Casa Troya is a wave-shaped woven bamboo house built using local materials in the traditional Osa Peninsula style. Half-height walls allow ocean breezes to cool the home while guests enjoy the ocean view. The casa is located in the extremely biodiverse region of Cabo Matalpo: four species of monkeys populate the area and the Audubon Society has named it one of the premiere places for bird watching in the world. Surfers congregate here too, with the beaches providing a variety of swells for all levels of surfers. 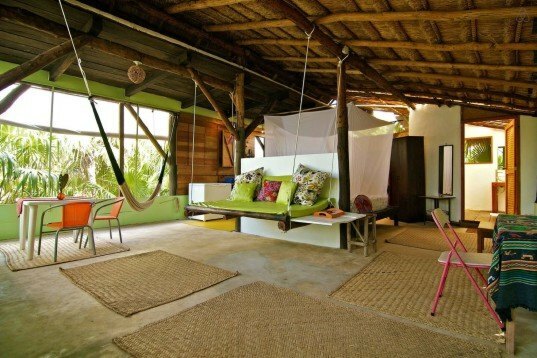 On the third floor of an open-sided palapa home, this apartment in a jungle treehouse almost floats among the treetops. Green parrots and Caribbean blue jays flutter by at eye level as you gaze out into the jungle canopy. Spend lazy afternoons wandering Tulum Beach, which is just a stone’s throw away and enjoy tranquil evenings watching the magnificent sunset. The off-grid house is entirely solar-powered and has a composting toilet. Jane Mountain is an incurable traveler and adventurer. For a complete roadmap to planning your own adventures get her free Travel Planner’s Cheat Sheet. 1. 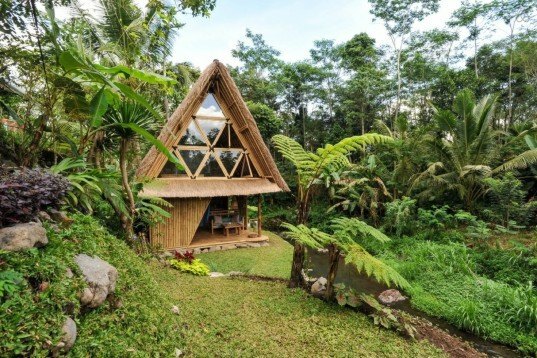 Hideout Eco Bamboo Home, Selat, Bali, Indonesia Hidden in the Balinese mountains, far from the tourist hordes who blight Bali's beaches, the Hideout makes visitors a part of Balinese village life. Vibrant green rice fields and a shimmering river are on display just outside the bamboo walls and exotic sounds of the Balinese jungle drift through the property. Electricity and water are both provided by the onsite waterwheel. How cool is that? Hidden in the Balinese mountains, far from the tourist hordes who blight Bali's beaches, the Hideout makes visitors a part of Balinese village life. Vibrant green rice fields and a shimmering river are on display just outside the bamboo walls and exotic sounds of the Balinese jungle drift through the property. Electricity and water are both provided by the onsite waterwheel. How cool is that? 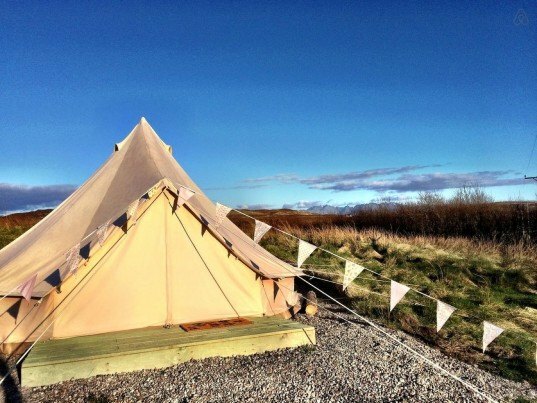 For tourists wanting to shed their hectic lives on a secluded island, these three eco tents in a remote corner of the Isle of Skye are just the ticket. Visitors spend their days hiking the rolling Scottish landscape or wandering along the deserted beach. Each tent is fully furnished and has its own fire pit and outdoor BBQ, while a shared camp kitchen tent is kitted out for cooking. Composting toilets and a "unique shower" round out the off-grid back-to-nature experience. With no running water or electricity, the island of Koh Ta Kiev is not exactly a tourist hot spot, which makes the Ten 103 Treehouse an idyllic location for letting go of all the stresses of everyday life. Each stilt house is hidden in its own part of the jungle, meaning once visitors step inside, the rest of the world just slips away. The open bamboo huts sit right on shore, providing wide open views of the warm turquoise water just a few steps away. Without electricity, the staff create gourmet meals in the resort's wood-fired oven and Texas-style smoker while bucket showers and pit toilets negate the need for running water. 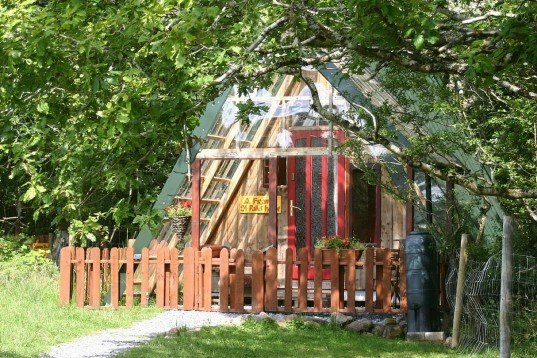 Settled on the edge of an enchanting Irish forest, this A-frame wood cabin may be the perfect place to meet Faerie folk. At the very least, guests will get to enjoy other wild creatures of the forest, like deer, foxes, and hedgehogs. The cabin is equipped with a gas heater, solar powered light while fresh well water fills guest's glasses. A communal kitchen and fireplace allow visitors to gather in the evening and share their enchanted forest stories. 7. Jungle Beach Treehouse, Tulum, Mexico On the third floor of an open-sided palapa home, this apartment in a jungle treehouse almost floats among the treetops. Green parrots and Caribbean blue jays flutter by at eye level as you gaze out into the jungle canopy. Spend lazy afternoons wandering Tulum Beach, which is just a stone's throw away and enjoy tranquil evenings watching the magnificent sunset. The off-grid house is entirely solar-powered and has a composting toilet. On the third floor of an open-sided palapa home, this apartment in a jungle treehouse almost floats among the treetops. Green parrots and Caribbean blue jays flutter by at eye level as you gaze out into the jungle canopy. Spend lazy afternoons wandering Tulum Beach, which is just a stone's throw away and enjoy tranquil evenings watching the magnificent sunset. 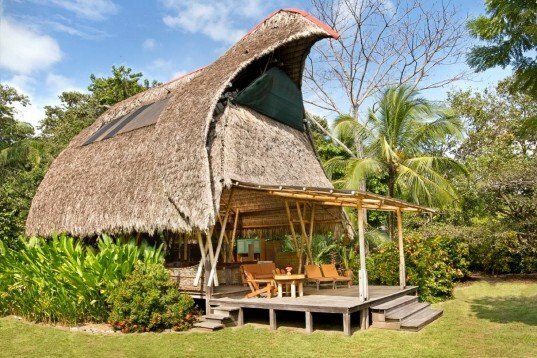 The off-grid house is entirely solar-powered and has a composting toilet.